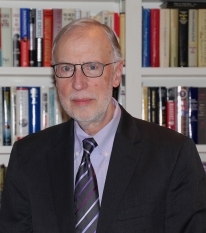 Dan Balz of The Washington Post is the winner of the 2014 Toner Prize for Excellence in Political Reporting. He was honored at an event Monday night in Washington, D.C., where former Secretary of State Hillary Rodham Clinton delivered the keynote address. The $5,000 Toner Prize, sponsored by the Newhouse School at Syracuse University, honors late alumna Robin Toner ’76, the first woman to serve as national political correspondent for The New York Times. Balz won the Toner Prize for a series of political profiles that illuminated the partisan divide in Washington. Toner Prize judge Adam Clymer called Balz’s coverage a “thoughtful look at the state of the Republican Party through the eyes of the old-line faction that put governing ahead of ideology.” The collection of stories also explores both parties’ divisions and factions. “Balz captures and tells all of this in his exceptional style,” said Toner Prize judge Charles Bierbauer. At the Toner Prize celebration, the awards are traditionally presented by Robin Toner and Peter Gosselin’s children, Nora and Jacob. The 2014 competition drew a record 165 entries from across the country and from across media platforms—including local television, digital-only news outlets and broadcast networks, as well as national and community newspapers. Former Secretary of State Hillary Rodham Clinton speaks at the Toner Awards Ceremony. Clymer, formerly chief Washington correspondent for The New York Times; Bierbauer, a former CNN political correspondent and now dean of the College of Mass Communications and Information at the University of South Carolina; Maralee Schwartz, a 30-year veteran journalist of The Washington Post and its former national political editor; Ann Grimes, a former journalist with The Wall Street Journal and now the Lorry I. Lokey Professor of the Practice at Stanford University; and Cynthia Tucker Haynes, a Pulitzer Prize-winning syndicated columnist who was editorial page editor of The Atlanta Journal-Constitution for 17 years. Toner, who graduated from Syracuse University in 1976, spent 25 years as a reporter for The New York Times. She began her journalism career in West Virginia with the Charleston Daily Mail and reported for The Atlanta Journal-Constitution. For The New York Times, she covered five presidential campaigns, scores of Congressional and gubernatorial races and most of the nation’s major public policy issues. She died in 2008. 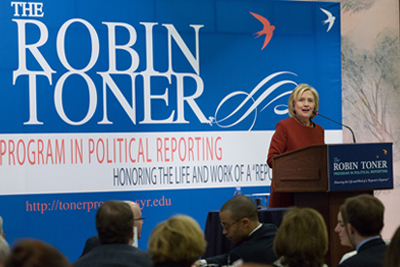 Her family, friends, classmates and Syracuse University have created an endowment for the Robin Toner Program in Political Reporting in the Newhouse School. Cochran’s counter to the tea party: Mississippi needs D.C.